We left Minneapolis on the road to Iowa. Why go back to Iowa? 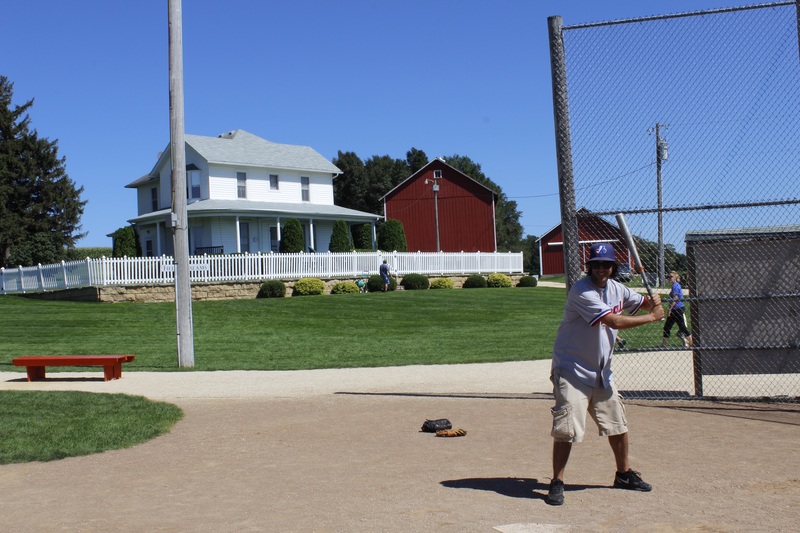 It’s in Iowa that was filmed the movie: Field of Dreams with Kevin Costner. For those of you that haven’t seen it: a farmer from Iowa is hearing a voice. The voice is telling him: If you build it, he will come. So he goes on and builds a baseball field on his field next to his corn crops. Is this heaven? No, it’s Iowa. The location is almost exactly kept like in the movie: the field, the house and the barn. It is free not only to visit but you can run the bases, throw the ball with your kids or friends or even just play ball! We got some friends and we played a bit with them! It’s such a nice place for people to get together for families or baseball fans! It really tempted us to think about building ourselves a baseball field. We left Iowa towards Wisconsin. Playing on the radio is the Badgers football game, college football team. It is the beginning of football season in the United States and we can feel it! Everywhere we go, stores are selling football jerseys and McDonalds is selling the Packers Pack: 2 burgers, 2 french fries and chicken nuggets. There is no drink included since they assume you are going for beer! Americans really love football and on all the levels! Everywhere around the Major league of baseball, we’ve heard always the same thing about the Milwaukee Brewers: they have the best tailgate in baseball. There is not a lot of places where we could tailgate in this tour but apparently, in Milwaukee, they are bringing this to another level. 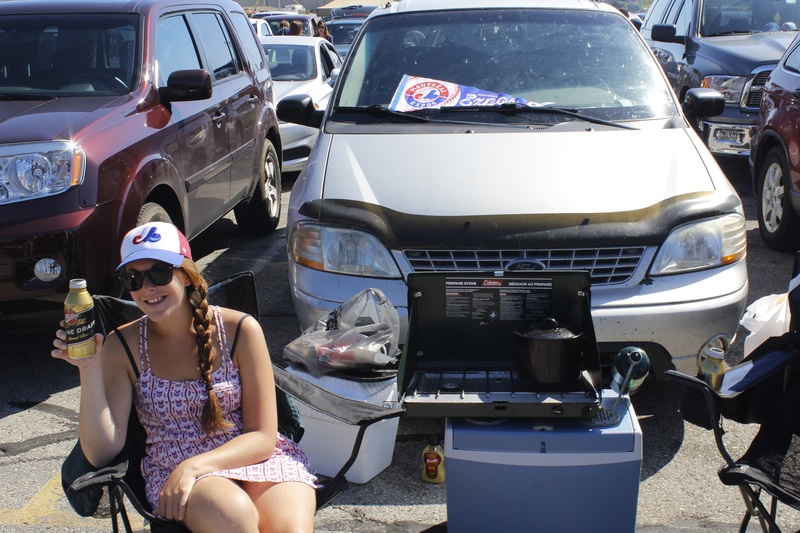 We were lucky; we had a Sunday afternoon game, which is a good moment for tailgating (compared to a Monday night!). We realized that it was something serious when we were waiting in line, at 9h45 a.m., for the parking to open at 10h10, and there was already over 20 cars waiting in line! In the parking lot, we decided to go with the full Milwaukee integration: we bought Bratwurst Style sausages and we got Miller beer to drink. Miller is THE Milwaukee beer and they are really proud of it and proud they are a stronghold against their main rival Budweiser (located in St. Louis). All around us, people were playing corn hole. We saw every kind of tailgaters: from older couple reading their newspaper and drinking wine to college kids taking ‘’shots’’ at 11am with their loud music! It’s a really nice experience and we can feel that this comes a lot from their football heritage: people in Milwaukee are big Green Bay Packers fans. 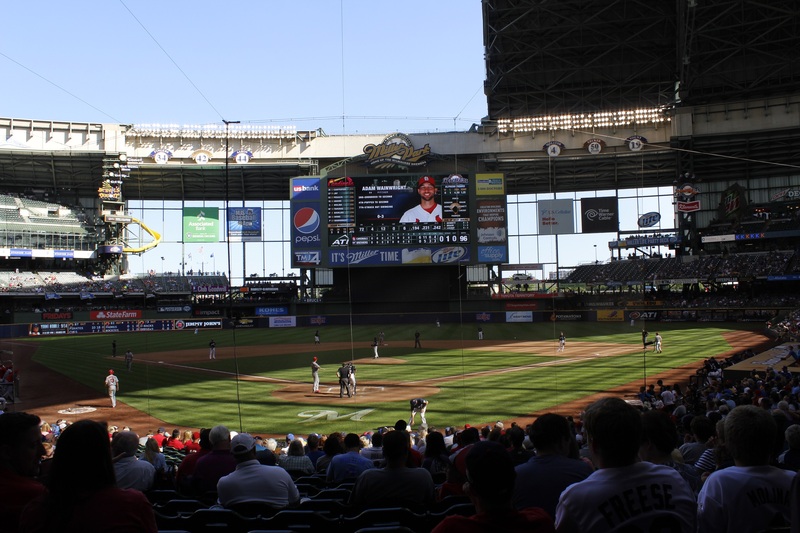 Miller Park, that is nicknamed the keg, was opened in 2001 after 5 years of construction. The ballpark has a retractable roof. It is divided in two pieces and can be closed in 10 minutes. They installed big windows to let the natural get inside the park. In the case of afternoon game like yesterday, one side of the roof was closed to give shade to the batters and the pitchers. 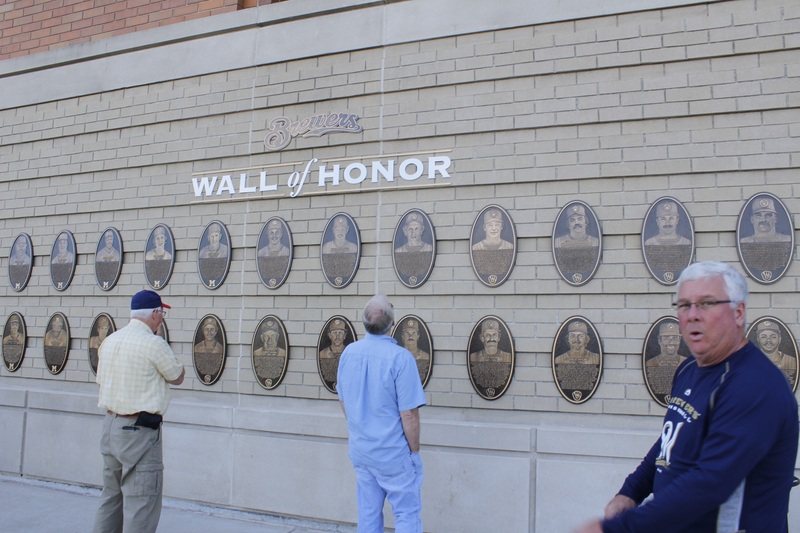 The Brewers recently added, outside of the ballpark, a wall of honor with plaques honoring different players and members of the Brewers organization like Hank Aaron and Robin Yount. We have to remind you Milwaukee was a baseball city before the Brewers. 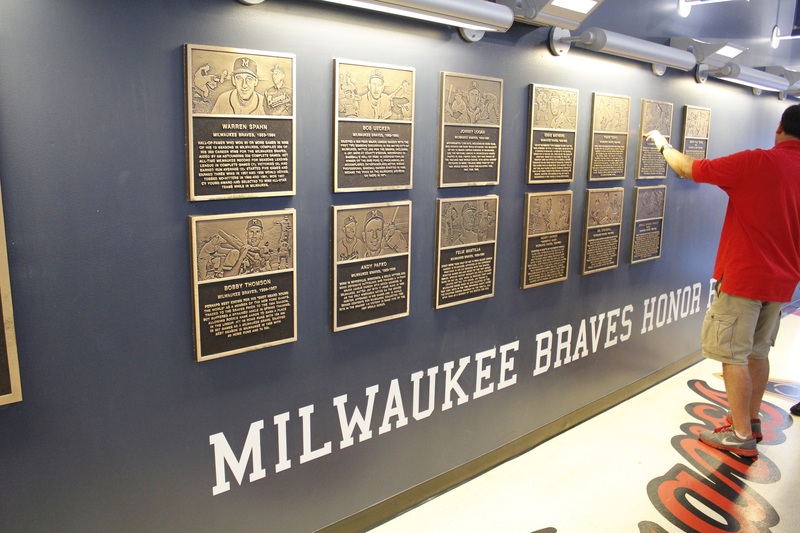 The Milwaukee Braves played there between 1953 and 1965. They are known to be the only baseball team that played more than one year and never have a losing record. In 1966, the team moved to Atlanta (to reach to a larger market). 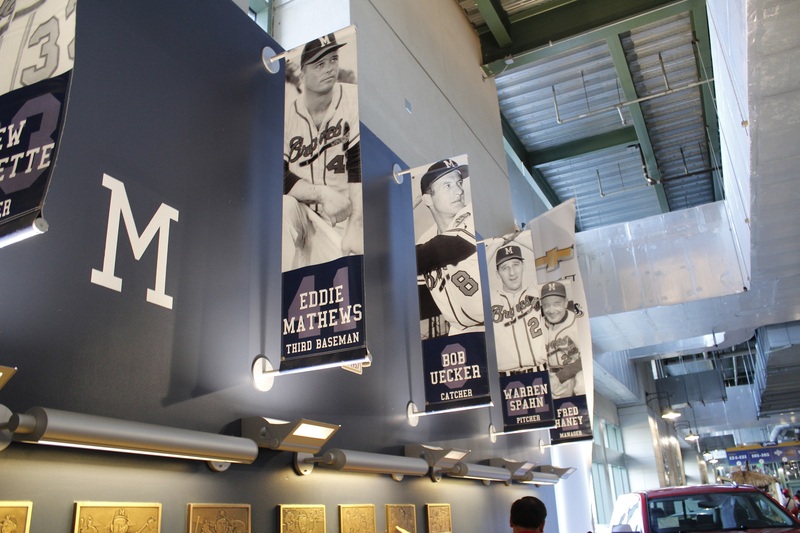 In the ballpark, they also created a wall honoring the Braves. We walked around the park to see that the team was honoring Bob Uecker a lot. Uecker was a baseball player that played for the Braves in Milwaukee and Atlanta. In 1971, he would become radio analyst for the Milwaukee Brewers and he is still doing this job at 81 years old. He is called by many: Mr. Baseball. He is also known for his catchphrase for the Brewers Home Run: Get up! Get up! Get outta here! Gone! At Miller Park the retired the number 50 during his 50th year in the brewers organization. Inside the park, we also discovered a large section for kids: usual speed pitch, batter cage and playground but they added a zone where you could run with the Brewers Sausages. We’ll take about them a little later. From our seats (by the way big thanks to Dave Kettlewood from Kansas City for hooking us up for seats behind home plate!) we spoke with two brewers fans next to us. They were really nice to us and gave us good information about the ballpark and the Brewers. 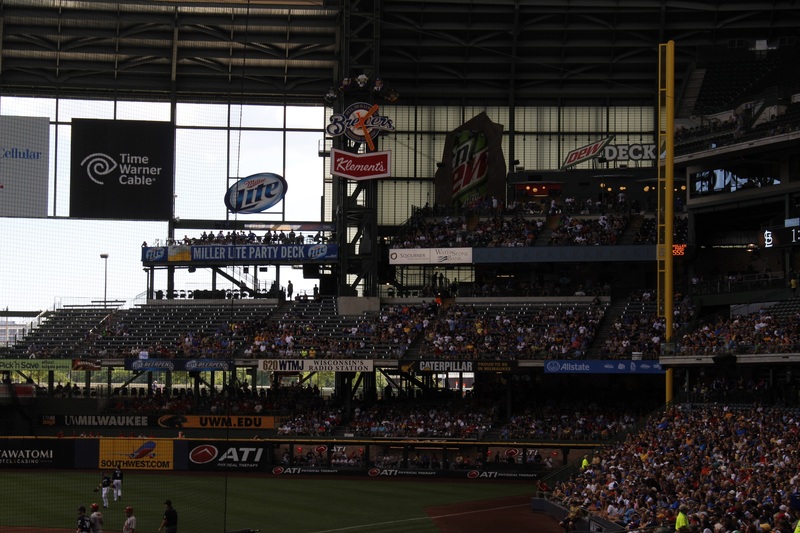 They told us about the different special seating in the ballpark: the Harley Davidson at left center field with an all you can eat buffet, the ‘’playpen’’ a fenced zone at right field close to the action and the Miller lite party deck with a climbing wall! They explained to us that Milwaukee was a small market but people will show up to games a lot especially during summer time whatever the team record. There is a bunch of things to do in Milwaukee so people come from out of town and they include a baseball game in their schedule. They also told us about the design of the field. It is definitively a ballpark that is batters friendly compared to their old ballpark where it used to be very hard to get the ball out of the park. 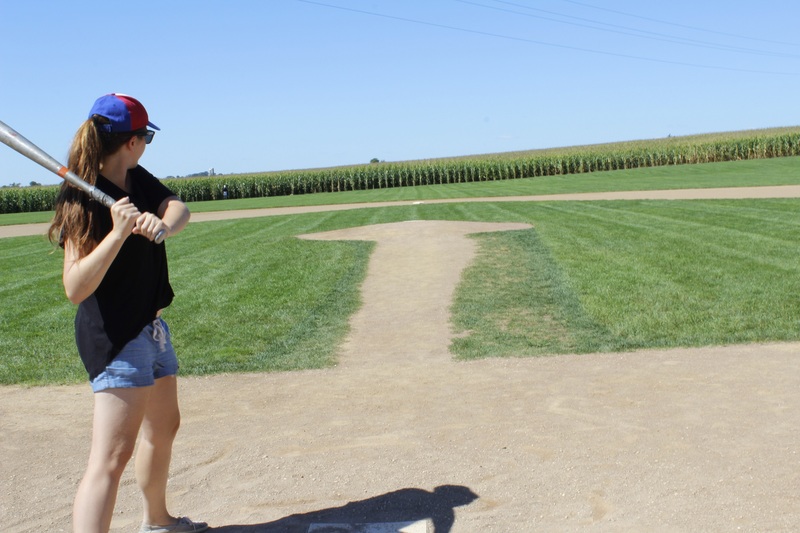 The field was designed with the help of former Brewers player Robin Yount. He wanted the center field wall no to be straight so they added some cuts so there is more chance for batters to hit triple or for the ball to give lucky bounces to the batter. 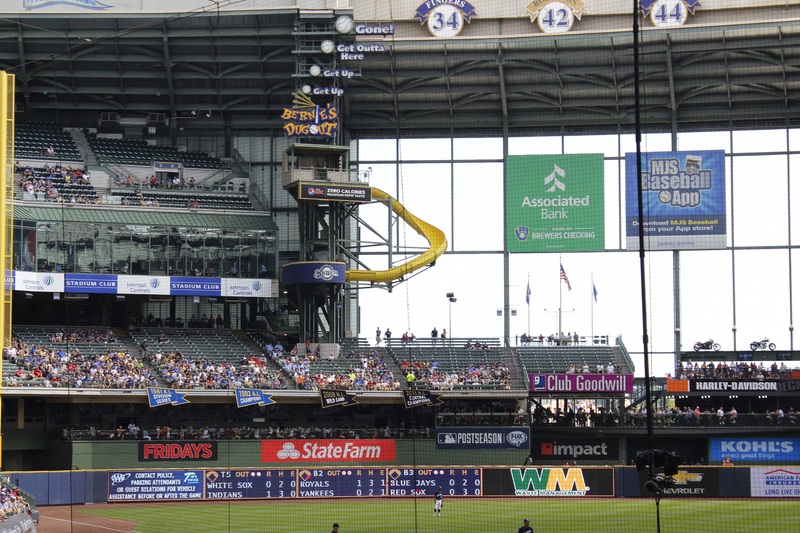 Another famous thing at Miller Park is the Slide. When the Brewers hit a Home run or wins a game, the team mascot, Bernie, Slides down it. We also have to talk about the famous Milwaukee’s. This race, which happens in the 6th inning, is composed of 5 mascots disguised as sausages: the Polish, the Italian, the Bratwurst, the Hot Dog and the Chorizo! They are racing from third base around home plate to first base. It’s an event that really gets the crowd going! 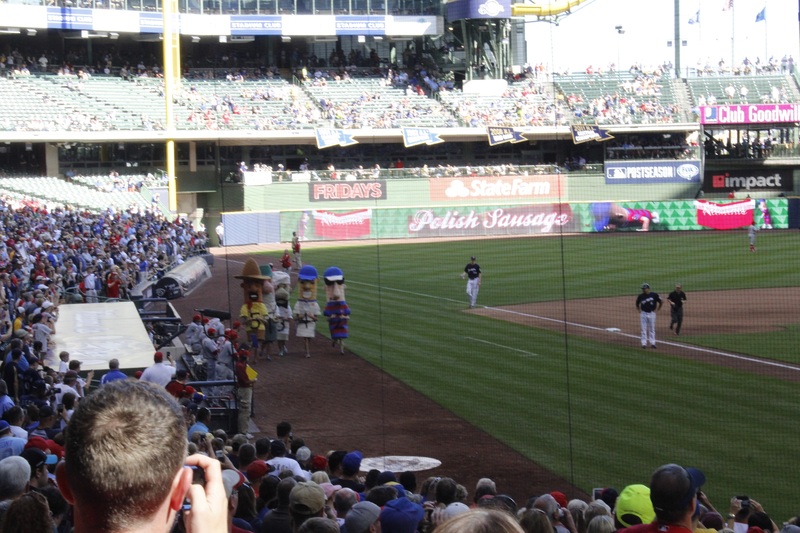 When we visited Miller Park, they had a relay race with kids disguised as sausages. It didn’t really work out well, some kids didn’t understood the principle of relay and ran right away to the finish line! It was chaos on the field but the crowd still loved it and we had a good laugh! I also had the chance to meet with the blogger behind Brewers Nation. He told me about the ballpark, the team and the fans. 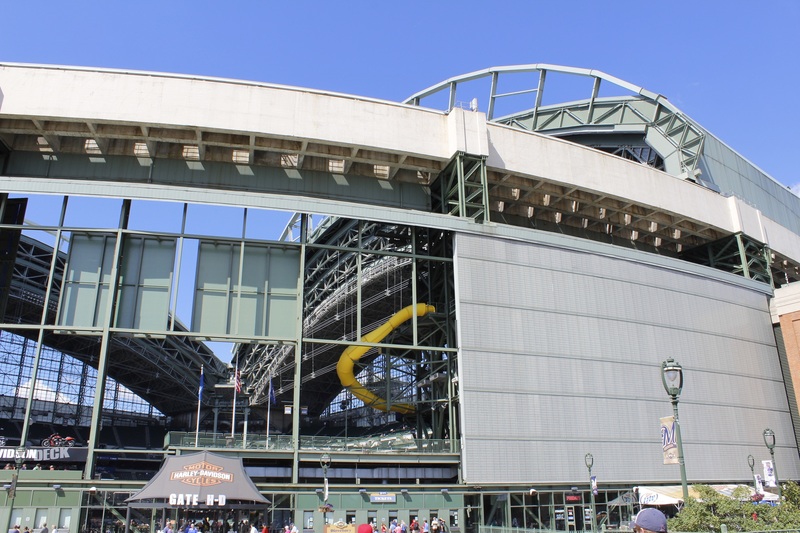 He told me that, like in other ballparks, the retractable roof is a security for fans coming from out of town so they’ll be sure to have a game when they travel to Milwaukee. I also asked him if Milwaukee was a baseball city or a Brewers city. His answer: Milwaukee is a baseball city in a football state. It’s a statement that we heard again after meeting with him. 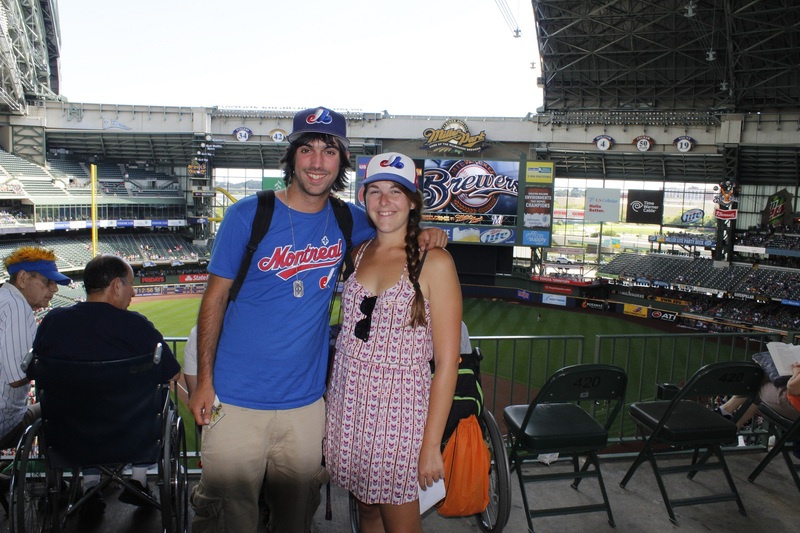 We understood that fans are most likely Brewers fans but also Badgers and Packers fans. It told us that, last Thursday, when the Packers played their first game, there were still a lot of fans at the Brewers game. It is always interesting to see how two teams can live together in a major city and it reminds us to think about what will happen with the Montreal Canadiens when we’ll get baseball back to Montreal: baseball season begins at the end of the hockey season and ends at the beginning of it. Thanks a lot for meeting us and helping us with our report! Baseball time! The Brewers were battling the St. Louis Cards. Those two teams met in the 1982 World Series and the Cards won it in 7 games. Those two teams also have a great beer rivalry: Milwaukee being the Miller city and St. Louis being the Budweiser city. Starting pitchers were Adam Wainwright (Cards) and Jimmy Nelson (Brewers). Game started off good on both side: only one hit allow on each side by the pitchers during the 3 first innings. The 4th inning would be fatal to Nelson: Jon Jay would score on a sacrifice fly, Jhonny Peralta would score on a single and on a triple, Parra and Molina would also come home: 4-0 Cards. Nelson would be replaced by Will Smith in the 6th inning. We would do a good job but we can’t say the same about the next pircher Brandon Kintzler. He will allow two more points to the cards: 6-0. It is not over; the cards would get three more runs in the bottom of the 9th, 2 of them on a Johny Peralta Home run. Meanwhile, Wainwright would allow only 7 hits and 1 run in the bottom of the 9th on a Carlos Gomez single. He would pitch the whole game. Final score: Cards 9 Brewers 1. Despite the hard loss, we could say that the Brewers fans encouraged their team for almost the whole game: people started leaving in the 9th. 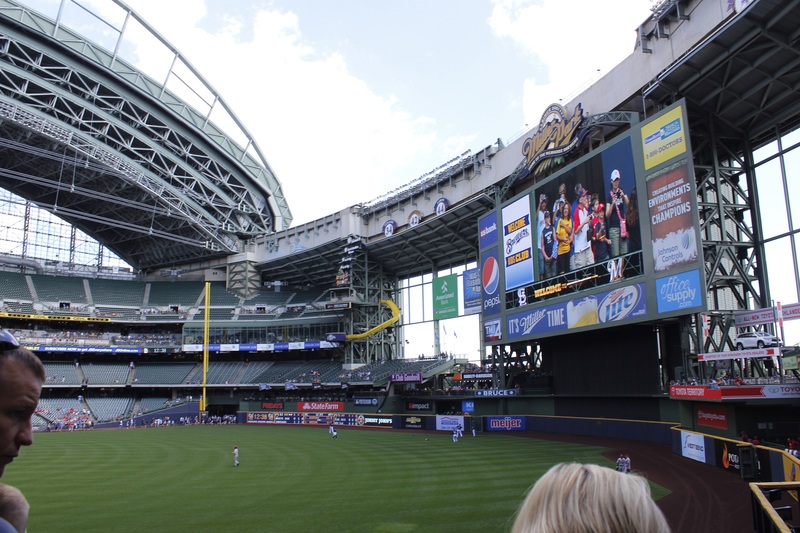 People in Milwaukee are attached to their team and they love baseball. All that is missing is for them to win a World Series. We could say that we got a funny reception at the Brewers. 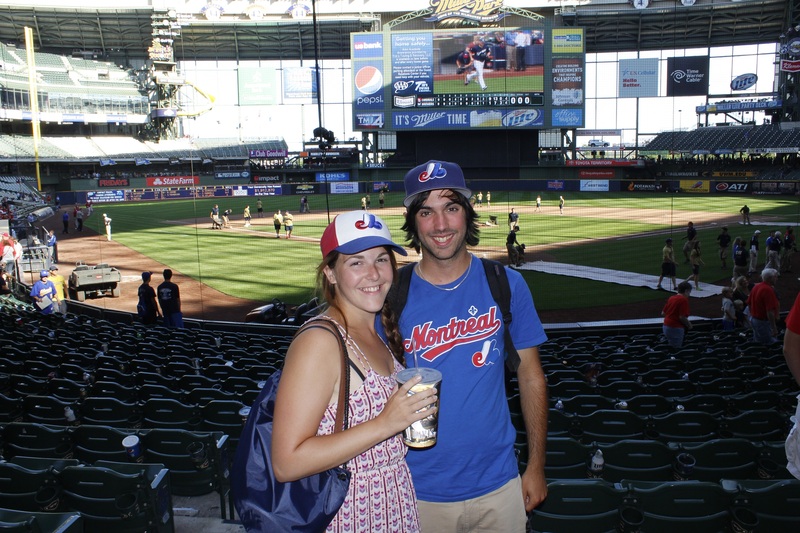 People didn’t acknowledge us for our Expos gear but they were pretty excited when they saw, on our van, all the ballparks we have visited this summer. All baseball fans would dream to do what we are doing. The Brewers are on a losing streak after having a great start in April. We will see if the fans would still show up at Miller Park with the beginning of the football season. Milwaukee is a small market like Montreal is so we should closely observe what is going on out there while we are trying to get are baseball franchise. We are leaving for Chicago where we have a baseball game on Monday night! P.S. Did you know that the Chorizo was added to the sausage race in 2007 to represent the Latino community in the Milwaukee region?